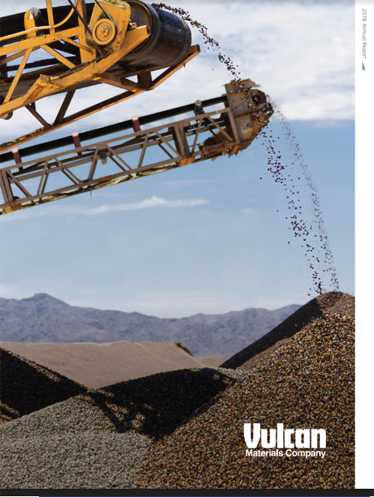 BIRMINGHAM, Ala., Jan. 30, 2019 /PRNewswire/ -- Vulcan Materials Company (NYSE: VMC) will host its fourth quarter earnings conference call on Thursday, February 14 at 10:00 a.m. CT (11:00 a.m. ET). Financial results for the quarter ended December 31, 2018 will be released before the NYSE market opens. The Company invites investors and other interested parties to listen to the live webcast of the conference call at www.vulcanmaterials.com. To participate by phone, call 800-347-6311 approximately 10 minutes before the scheduled start. For international calls, the number is 720-543-0197. The confirmation code is 7323197. A replay of the webcast will be available approximately two hours after the call at the Company's website. Vulcan Materials Company, a member of the S&P 500 index with headquarters in Birmingham, Alabama, is the nation's largest producer of construction aggregates – primarily crushed stone, sand and gravel – and a major producer of aggregates-based construction materials, including asphalt and ready-mixed concrete. For additional information about Vulcan, go to www.vulcanmaterials.com.